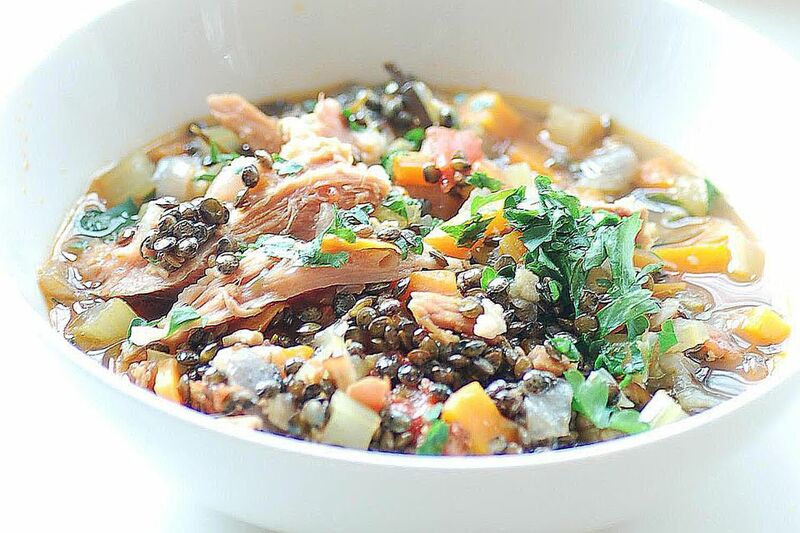 It doesn’t take much cooking skill to make this lentil soup recipe taste great. The smoked ham hock and a couple hours are really all it takes to make this incredibly satisfying soup. Add the beef broth, chicken stock, dried thyme, black pepper, bay leaf, cayenne, and ham hock into a soup pot and bring to a simmer. Cover and simmer on low for 1 1/2 hours. Add the onions, celery, and carrots and simmer covered for another 30 minutes. Add the lentils and simmer cover for another 30 minutes, remove cover and skim off any excess fat on the surface. Continue to simmer another 15 to 20 minutes uncovered, until the lentils are tender and the pork is falling off the bone. Taste for salt, adjust seasoning, and serve with chopped fresh parsley.